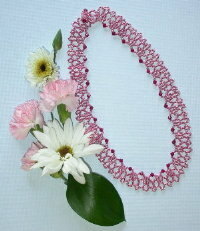 Sandra works her seed bead magic with Swarovski crystals to add sparkle amidst the loops and swirls of beaded lace in this ultra-feminine 16 inch choker. The beadwork curves gently to follow the contours of your neck. Delicate by day and glamorous by night, select your favorite bead colors and stitch a fashion accent you’ll reach for again and again.